Philadelphia is a culturally diverse city, with immigrants from China, Vietnam, Korea, Africa, the Middle East, India, and Mexico having moved to the area over time. For many immigrants, having a center for education, social and cultural activities, and religion becomes an issue when they first move to a new place. For the Chinese community, this issue was solved with the formation of the Holy Redeemer Chinese Catholic Church, in 1941. Although the Chinese community in Philadelphia has existed since the mid-19th century, they didn’t have a center where they could congregate and celebrate their culture. In 1939 Bishop Paul Yu Pin visited the rectory of Saint John the Evangelist Church – a major church in Philadelphia – to talk to the Chinese community about current events in their home country. There were only a few Chinese Catholics, and most of the immigrants were scattered around the area. This made it difficult for the Bishop to gather them. To resolve this, Cardinal Dennis Dougherty supported Father William A. Kavanagh to gather Chinese immigrants to learn about religion. Together, they increased the number of Catholic Chinese in the area. In October of 1939, the first 9 Chinese immigrants were baptized. Their numbers only grew with time and by Pentecost Sunday of 1940, there were 58 converts ready for the sacrament of confirmation. Funds were raised and gifts were received from benefactors through the years, until finally, the Holy Redeemer Church and School was built. 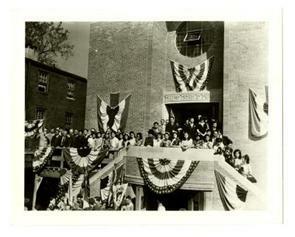 On October 5th 1941, the new facility was dedicated, and made history as the first church built for the Chinese community in the Western hemisphere. Initially staffed by the Missionary Servants of the Most Blessed Trinity, Capuchin Friars from the Saint John Evangelist Church provided priest service for the Church and School after 1992. They gave the Chinese community a center for religious life, cultural and social engagement, and education for the children. In the past two decades new immigrants have increased the Catholic population. Now mass is given in Cantonese, Mandarin, and English. Social services, bible classes, and Sunday school can also be found at the Holy Redeemer. School attendance has also increased; Adult English classes are provided. The center is also a recreational place for children when their parents are at work. 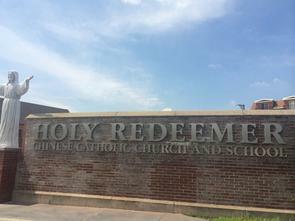 Through the multiple services they provide for the public, the Holy Redeemer Chinese Catholic Church has been so successful that it was deemed “a leading Chinatown institution” by The New York Times. It is clear that the center has become an icon of hope, knowledge, and culture, bringing the community together as it always intended. 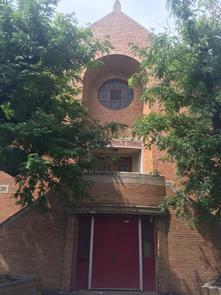 "Philadelphia Holy Redeemer Chinese Catholic Church And School. 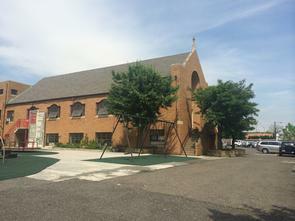 "Philadelphia Holy Redeemer Chinese Catholic Church And School. N.p., N.d. Web. 24 Nov. 2014. <http://www.holyredeemer.cc>. Holy Redeemer Chinese Catholic Church (Philadelphia, Pa.). Holy Redeemer Chinese Catholic Church Papers 1939-1975. N.d. MS, MSS030. Philadelphia. Historical Society Of Pennsylvania. Web. <http://www2.hsp.org/collections/Balch Manuscript_guide/html/holyredeemer.html>. Wallace, David J. "Near Philadelphia's Chinatown, 51 New Homes." The New York Times. The New York Times, 07 Mar. 1998. Web. 24 Nov. 2014. <http://www.nytimes.com/1998/03/08/realestate/near-philadelphia-s-chinatown-51-new-homes.html>.